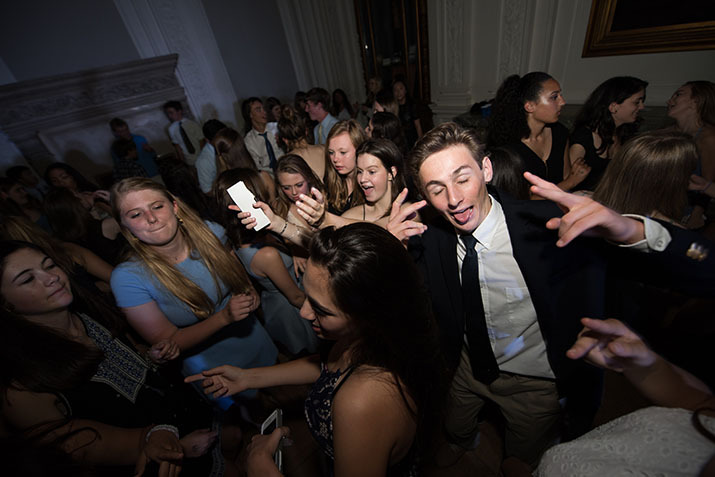 Convent and Stuart Hall students dance while at the Homecoming dance last Saturday. The dance boasted an attendance record of 242 people. Two hundred forty-two Convent & Stuart Hall students poured into the Main Hall of the Flood Mansion on Saturday for the Homecoming dance featuring mini golf, a DJ and dancing, and a chocolate fountain. Attendance was the highest of any dance in recent memory. The event began at 6:30, but the majority of the crowd did not arrive until after 7 p.m. because the Homecoming game did not finish until after 4:30. “I felt like the space in between the two events was too small because if you lived far away from the school or your house, it was not an adequate amount of time,” Michael Liu ’18 said. The strong showing of support started at the Homecoming game earlier that afternoon, as attendees bought a game T-shirt to receive discounted admission to the dance. The expansive Main Hall of the Broadway campus and use of the Reception Room off the Belvedere took the pressure off of students to dance by giving them room to socialize. “I think it made it better because it gave you room to dance and then also provided space to talk and just chill as well,” Gordon Smit ’18 said. The Homecoming game and dance was organized by the Student Councils of both Stuart Hall and Convent High Schools. “Key to our success has been a great line of communication with the leadership on Convent and a really dedicated group of guys,” Tellini said. The high attendance is a testament to the school spirit that was on high at both the game and nd dance, something that Student Council hopes to keep going in the future.